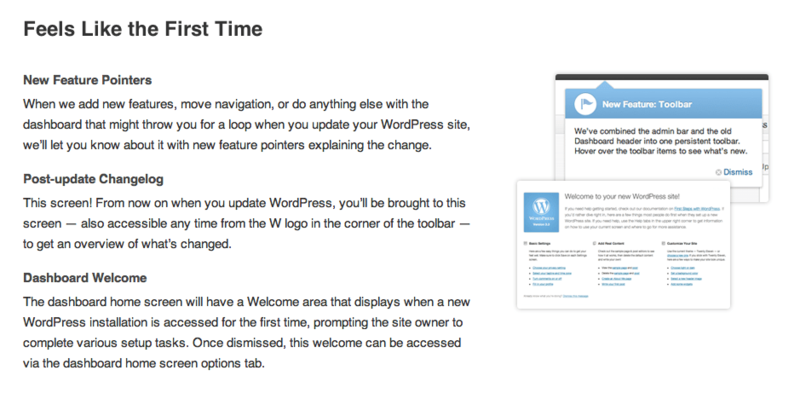 The first hint that something new is afoot comes right after you run the update: instead of the usual “You’re running the latest version of WordPress” message, you’ll see a handy welcome screen that gives you an overview of all the new features in 3.3. If you’ve been feeling ho-hum about the WordPress admin dashboard, get ready to celebrate. This update completely re-thinks the Dashboard UI, adding flyout menus, a persistent admin toolbar at the top of every screen, and help tabs everywhere you need them. 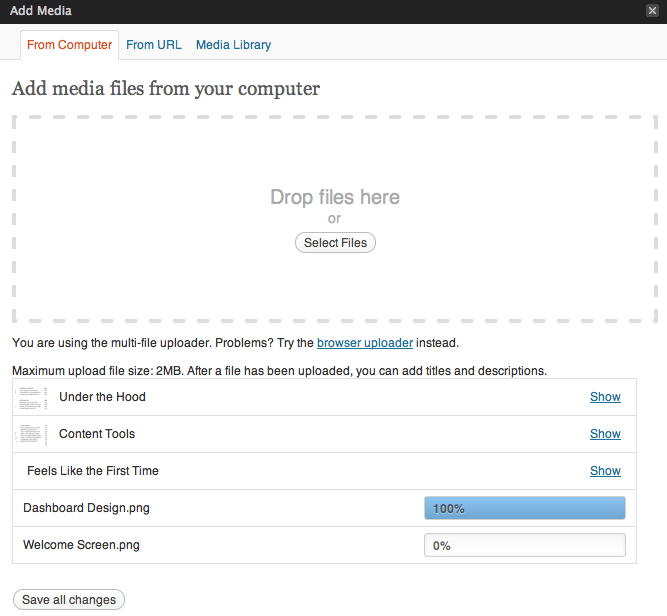 The post editing tools have been updated as well; one of the most significant is the media uploader, which now features a single icon instead of an icon for each content type. This makes perfect sense, and is a welcome change – though it may be jarring if you’re used to picking a content type before you upload! If you use Tumblr, you’ll be pleased to note that there’s now an easy way to import your Tumblog into WordPress. Hint: use a theme with Post Formats to make the transition as seamless as possible. There have been some behind-the-scenes updates as well: permalink options have been updated, jQuery has been updated to 1.7.1, and there’s a new API for working with admin screens. Have you updated yet? Get cracking! And let us know your thoughts on the new version in the comments. 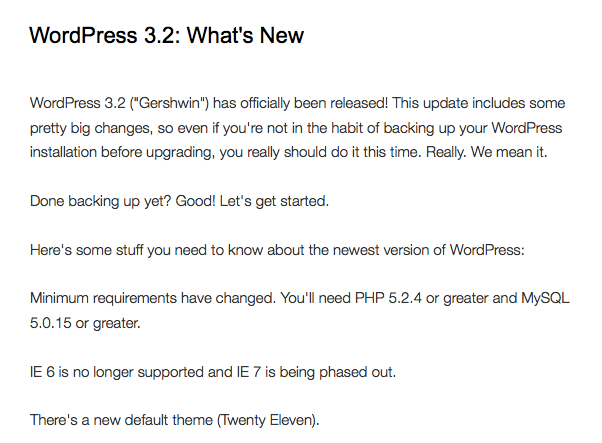 WordPress 3.2 (“Gershwin”) has officially been released! 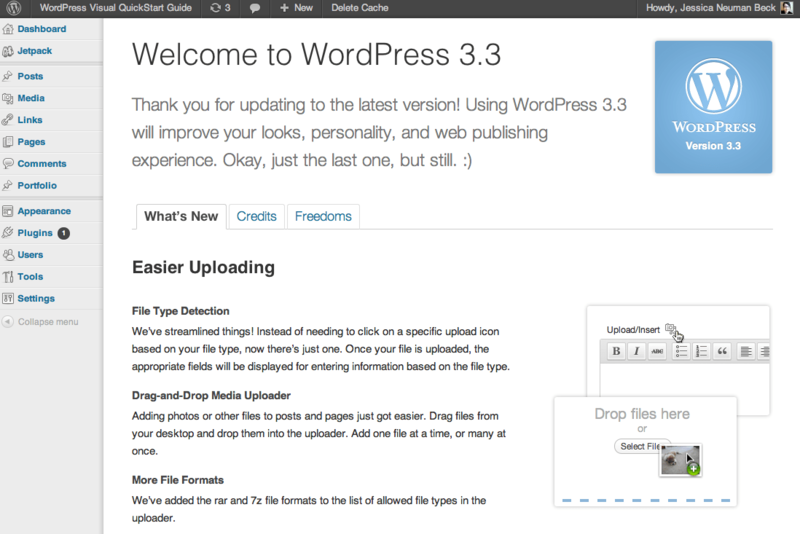 This update includes some pretty big changes, so even if you’re not in the habit of backing up your WordPress installation before upgrading, you really should do it this time. Really. We mean it. Done backing up yet? Good! Let’s get started. Minimum requirements have changed. You’ll need PHP 5.2.4 or greater and MySQL 5.0.15 or greater. IE 6 is no longer supported and IE 7 is being phased out. There’s a new default theme (Twenty Eleven). The Dashboard UI has been refreshed with a brand new look – it’s cleaner, easier on the eyes and sporting some slick typography updates. The ‘Press This’ bookmarklet has a new UI as well. When creating a post, you can now enter fullscreen mode, a gorgeously distraction-free space that lets you concentrate on writing. 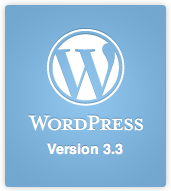 There are a bunch of updates to the core files as well, making WordPress much lighter and faster-loading. For a full breakdown of the new features, check out the Codex.